My second holiday reading choice was last year's Costa Book of the Year, Nathan Filer's The Shock of the Fall. The book has a non-chronological narrative pieced together by protagonist Matthew and describes the gradual process - beginning with the early death of his brother Simon, who has Down's Syndrome, during a childhood holiday - that leads up to him being sectioned under the Mental Health Act. You could be forgiven for thinking this sounds depressing, but in fact it rarely is - it's certainly desperately sad at times, and you'll often find yourself frustrated with Matt and some of the choices he makes, but there's plenty of wry, observant humour and a great deal of warmth, particularly in some of Matt's family relationships (Nanny Noo, his ever-patient grandmother, is a delight). 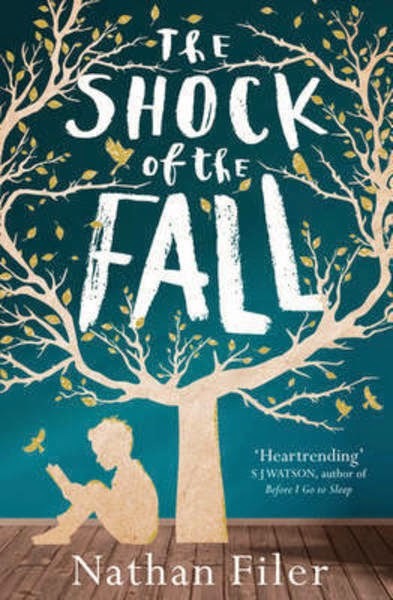 According to his author bio, Nathan Filer still works as a mental health nurse on an in-patient ward, and The Shock of the Fall is certainly a brilliantly vivid and realistic journey into the UK's mental health care system and the slow development of Matt's condition. Lots of reviewers have talked about Matt's schizophrenia being 'caused' by Simon's death, but in fact The Shock of the Fall makes it very clear that things just aren't as simple as this: there are no clear answers. The story refers in passing to many other possible contributing factors, from a family history of mental illness to heavy cannabis use in Matt's early teens. Filer also takes care to drop various early clues to Matt's condition into the story, but impressively manages to do so without ever drawing obvious attention to what must have been his extremely thorough research. However, Simon's premature death is still central to the novel, and only as the story begins to draw to a close do we find out exactly what happened to him. Simon, even in his absence, becomes a major character in his own right, and when Matt's hallucinations begin to take Simon's form, it's almost as if Simon was too big an influence on Matt's family to stay dead. The challenge they face is finding the best way to remember him. I've seen several critics liken this book to Mark Haddon's The Curious Incident of the Dog in the Night-time, and I can certainly see why they'd make that comparison. Like Haddon's novel (which I also enjoyed), The Shock of the Fall is remarkably insightful in its depiction of the thought processes of someone whose mind works in a way that's strongly atypical, and it's also similarly revealing in terms of the pressures placed on the protagonist's family and friends, all of whom are flawed in their own right and often realistically out of their depth. I found The Shock of the Fall gripping, heartbreaking and touching, and I'm struggling to find any real fault with it. Highly recommended.